Synopsis, Our Opinion: This was one of the best inexpensive Chianti table wines we’ve ever had. 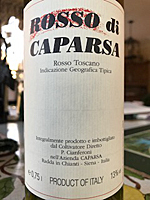 Producer/Winery: Paolo Cianferoni; Azienda Agricola Caparsa; Radda in Chianti (Siena), Italy. Grape Variety: Sangiovese blend – Sangiovese, Malvasia and Trebbiano. 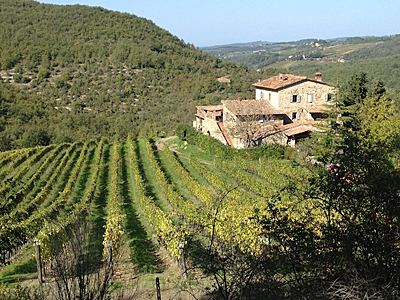 Geographic Appellation,, Region, Country: Radda in Chianti; Tuscany, Italy. Paired With: Venison lasagna (made with roasted tomato sauce) and a garden salad. Opened one hour before drinking. Clear ruby color with the same color rim. Abundant aromas of leather, cherry, potpourri on a rainy day and new clay flower pots wet for the first time. Somewhat rustic, approachable, dry, medium body and a 100-grit texture. Rich zesty cherry, raspberry and blackberry flavors. Plenty of bright acidity, oodles of fine-grained firm tannins and a long spirited finish. WOW, as the entry level Caparsa Chianti this was SPECTACULAR…a bouquet that was unique for Chianti, heavier body than expected, loaded with delicious tastes and an audacious character, yet fresh and light in the mouth from start to finish. Perfect pairing with the venison lasagna and a delight sipping with out food after the dinner. This was one of the best inexpensive Chianti table wines we’ve ever had. It’s a keeper!!! Comments: Learn more about Caparsa and their wines. See also: our reviews of other Caparsa wines.